Entrepreneurs work at an iHub in Nairobi Kenya. Africa’s mobile phone market has rapidly expanded in the past five years, and its Internet bandwidth has grown twentyfold. That access is driving entrepreneurship to deliver innovative solutions in Africa for Africa. Building a competitive ICT industry could promote innovation, job creation, and boost the export potential of African companies. In the past five years, Africa’s mobile phone market has rapidly expanded to become larger than either the EU or the United States with some 650 million subscribers. At the same time, Internet bandwidth has grown twentyfold as hundreds of thousands of kilometers of new cables have been laid across the continent to serve an increasing number of its 1 billion citizens. The new access is quickly changing lives, driving entrepreneurship fueled in part by collaborative technology hubs, and delivering innovation and home-grown solutions for Africa. In the new report eTransform Africa: The Transformational Use of Information and Communication Technologies in Africa, the authors follow that growth, documenting innovations in ICTs and advances in access for the population. They emphasize the need to build a competitive ICT industry to promote innovation, job creation, and boost the export potential of African companies. “The Internet and mobile phones are transforming the development landscape in Africa, injecting new dynamism in key sectors. The challenge is to scale up these innovations and success stories for greater social and economic impacts across Africa over the next decade,” says Jamal Saghir, World Bank Director for Sustainable Development in the Africa Region. Agriculture: In Kenya, the Kilimo Salama program is providing crop insurance for farmers, using the M-PESA payment gateway, helping them to better manage natural hazards such as drought or excessive rainfall. Climate change adaptation: In Malawi, a deforestation project is training local communities to map their villages using GPS devices and empowering them to develop localized adaptation strategies by engaging communities. Financial services: In Senegal, SONATEL (a subsidiary of Orange) is one of the latest operators on the continent to launch a money transfer service that is enabling 200,000 subscribers to send and receive money using mobile phones. Health: In Mali, telemedicine is helping overcome the lack of trained healthcare workers and specialists in rural areas, specifically the IKON Tele-radiology program. “This report not only sheds light on the path Africa is already on, but also encourages continued creative thinking in how to utilize ICTs to benefit more Africans,” says Gilbert Mbesherubusa, Acting Vice-President Operations, African Development Bank. The report shows how countries such as Kenya and Senegal are implementing ICT-enabled trade facilitation initiatives and outlines the key role that Africa’s Regional Economic Communities can play in supporting greater regional integration for boosting economic growth and reducing costs.
" Africa is rapidly becoming an ICT leader. Innovations that began in Africa – like dual SIM card mobile phones, or using mobile phones for remittance payments – are now spreading across the continent and beyond. " eTransform Africa also documents the flowering of technology hubs across Africa – such as iHub and NaiLab in Kenya, Hive CoLab and AppLab in Uganda, Activspaces in Cameroon, BantaLabs in Senegal, Kinu in Tanzania or infoDev’s mLabs in Kenya and South Africa. These hubs are creating new spaces for collaboration, innovation, training, applications and content development, and for pre-incubation of African firms. “Africa is rapidly becoming an ICT leader. Innovations that began in Africa – like dual SIM card mobile phones, or using mobile phones for remittance payments – are now spreading across the continent and beyond,” says Tim Kelly, lead ICT policy specialist at the World Bank and an author of the report. “The challenge going forward is to ensure that ICT innovations benefit all Africans, including the poor and vulnerable, and those living in remote areas,” he adds. Deployment of ICTs and the development of applications must be rooted in the realities of local circumstance and diversity. Governments have an important part to play in creating the enabling environment in which innovations and investments can flourish while serving as a lead client in adopting new innovations and technologies. Effective use of ICTs will require cross-sectoral collaboration and a multi-stakeholder approach, based on open data and open innovation. Most innovative ICT applications in Africa have been the result of pilot programs. The report says now is the time for rigorous evaluation, replication and scaling-up of best practices. 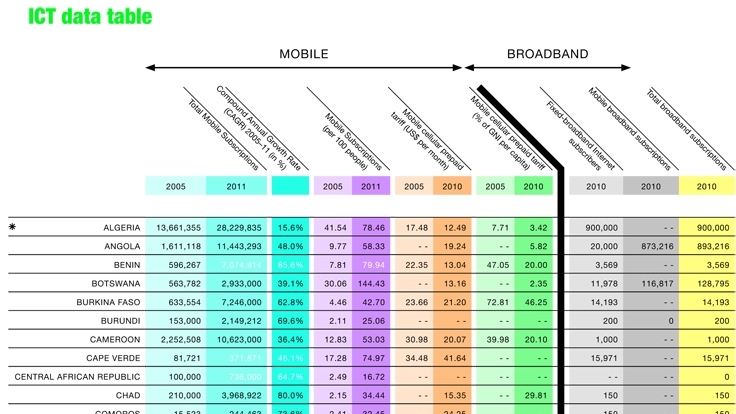 eTransform Africa includes more than 20 case studies of ICT transformation in action in Africa, as well as a statistical annex presenting the latest data on mobile and broadband access in African countries. The study received funding from the AfDB Korean Trust Fund and the World Bank Pfizer Trust Fund.